Relevant article selected from the GR archive, first published on GR in December 2015. “Butcher”; “thug”; “dictator”; “murderer”; “savage”; “tyrant”; “oppressor”; “despot”. These are just some of the words that many in the Western world associate with the Syrian President, Bashar al-Assad, after six years of incessant and hypnotic war propaganda. Democratically elected leader of a sovereign country however, is not a narrative the propagandists want to be circulated. The 2014 election in Syria is an event that the ‘Ministry of Truth’ in the West desperately wants to be memory-holed, as it runs in stark contrast to the narrative they are still trying to inculcate in the minds of the public. 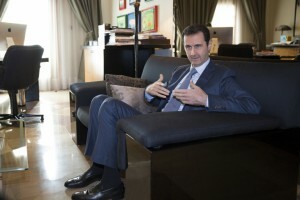 In June 2014, Assad won Syria’s Presidential election with 88.7 percent of the vote, in the country’s first multi-candidate election in almost five decades. In a country which had a population of 17,064,854 in July 2014 (according to an estimate from CIA World Factbook), over 10 million people voted for Assad. 73.42 percent of the Syrian population voted in the election, with voting only taking place in government controlled areas. A group of international observers emphasized that the election was a valid and democratic expression of the views of the Syrian people. Predictably, Western nations denounced the election as a sham and a fraud, with US Secretary of State, John Kerry, calling the election a farce a few months prior to the vote. Despite the efforts of the Western establishment to delegitimize the election, it is obvious that Assad has popular support in Syria. The Western narrative – which claims that Assad is an insane dictator who butchers his own people – is illogical, as if this was true, Assad would have been ousted years ago. How can a man stay in power for so long if the majority of the Syrian population is fervently against his rule? Considering the fact that the entire Western world has been obsessively trying to overthrow him for years, in addition to many governments in the Middle East – the Gulf States, Turkey, Israel, Jordon… – there is absolutely no way Assad could survive without having a large support base in Syria. A large section of the Syrian population understands that if Assad is ousted from power at the present moment in time, and the government is destroyed, Syria will cease to exist as a sovereign, cohesive state, and will be Balkanized into feuding rump states. Lost in the incessant demonization of the latest bogeyman of the mainstream media however, are the crimes of Western leaders. Comparative to the plethora of imperial butchers in the Western world, who still manage to escape prosecution for their crimes, the Syrian President really is an angel. Tony Blair and George Bush launched a war of aggression in Iraq that has killed and maimed millions of innocent people, an invasion that was denounced by the former United Nations Secretary General, Kofi Annan, as “illegal”. In 2011, a Malaysian tribunal which applied the Nuremberg Principles to the 2003 war found that both Bush and Blair were guilty of war crimes. The illegal war in Iraq is just one example of the abhorrent crimes of the West and the flagrant hypocrisy of its leaders. Unfortunately, there is no accountability for the criminal class in the Western world, only a conveyer belt of future Machiavellian leaders.